Whenever anyone asks me for date night ideas, one of my MANY recommendations is to schedule a mini photo shoot. (Which for me to have been single for as long as I have… I have a ton of ideas). And no, I’m not being biased because I’m a photographer, but a photo shoot with bae is so much fun! It allows you to take the edge off and enjoy each other and it allows you the opportunity to reconnect and remember exactly what it is about bae you love so much! 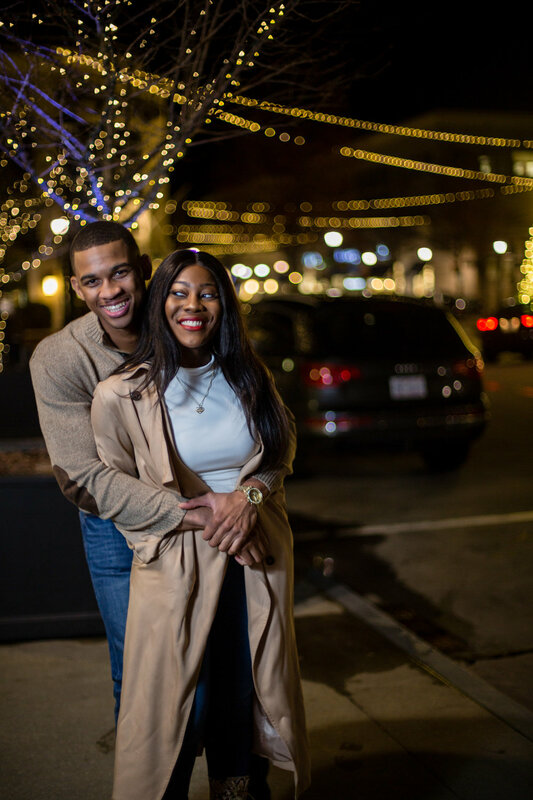 If I had to bet money on which of my clients would book a photo shoot for date night, it would definitely have been Leasia. I was right! She has such a bright and vibrant spirit and she loves being in front of the camera… and the camera loves her back! Her boyfriend, Cleveland, has her same infectious energy. I was excited when Leasia contacted me for this shoot. Especially since after years and years of recommending my clients book me for their date nights, I finally had one on the books. Leasia wanted to kill two birds with one stone, she also wanted photos of her and Cleveland for Christmas. We wanted to find a location that was beautifully decorated for Christmas so we headed to North Hills here in Raleigh for their shoot. The ginormous Christmas tree was the perfect backdrop for a lot of the frames. It was truly beautiful. What added fuel to the fire was actually seeing the love that Leasia and Cleveland share and how much they genuinely enjoy each other’s company. Leasia + Cleveland, thanks for trusting me as your photographer and inviting me into your lives again to capture this special moment for you! Cleveland, I expect a phone call when you’re preparing your surprise engagement, sir! I’ve got to capture that!